Furo-en Garden (不老園) is one of the plum garden located in Kofu, Yamanashi Prefecture. There are 20 kinds 3200 plum trees and other trees in this garden. The garden is designed to make plum stand out beautiful. Pine trees, cherry trees, Azalea and maple trees are placed to make a harmony of Japanese scenic beauty. Furo-en is located on the side of small hill and has a great view of Kofu basin including Mt. Fuji. The plum bloom from the middle of February to the middle of March and the best timing to visit this garden is around the end of March. Plum has not only the beautiful and colorful flowers, but also it has a very nice smell. The admission: 500 yen for adult, 200 yen for kids. Season: Feb. 1 to the end of March. 1. use JR Chuo Line to Sakaori Station. Furoen is the plum garden located in Kofu city, Yamanashi Prefecture. 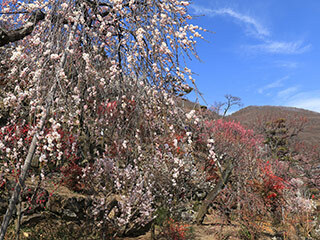 There are 3,000 plum that bloom and tell the arrival of the spring to the visitors. There are 20 different hiking trail and hill slope that you can enjoy the beautiful plum flowers with great view of Mt. Fuji and Kofu Basin. During the season, there are food shops and gift shops in this garden that sales the local products of Kofu. The park was conceived by the 7th generation of the Okumura family in 1912 who owned traditional Japanese clothing retail and wholesale business located in downtown Kofu. Shouemon Okumura who owned several acres of hilly property had a dream to develop it into a plum blossom park.